Great Valley Grasslands Floodplain Restoration Project Funded! Yesterday, the California Department of Fish and Wildlife announced it will be funding the final design and construction of American Rivers’ Great Valley Grasslands Floodplain Restoration Project! CDFW has committment $1.3 million to the project which will fund final engineering design and construction. Great Valley Grasslands State Park is located near Turlock, CA, along the San Joaquin River, and contains and contains most of the only remaining untilled native grasslands in California’s Central Valley. The park is also part of the greater Grasslands Ecological Area, which contains California’s largest remaining contiguous block of wetland habitats. Even more, it contains numerous Native American archaeological deposits. These features make the site an incredibly unique location with significant habitat value. 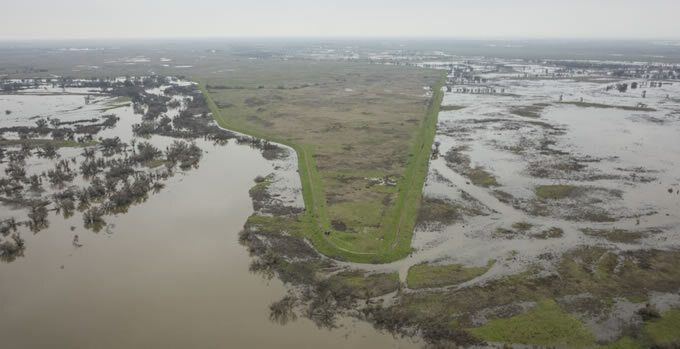 Unfortunately, there are a number of historical levees on the site that disconnect a significant portion of the park from the river yet do not protect any structures or private land. The photograph below shows how this occurred during high flows in February 2017. American Rivers has led the project, working with stakeholders such as California State Parks and the Lower San Joaquin Levee District. FlowWest has been working on this project for almost 8 years, including the initial conceptual studies, engineering design, hydraulic simulations, and CEQA/NEPA compliance and permitting. Final design will occur in 2019, and construction likely in 2020. Congratulations to our friends at American Rivers for winning the funding for this awesome project! FlowWest is a Federally registered Small Business and a California Small Business Enterprise.